Oh my goodness where has the time gone. I was sure when I was adding the title to the post that I had only been part of this project for three weeks yet it is actually four. The theme for this week was 'not found in a mall'. Now I am not one that hits the mall very often at all. I think that the last time was in February of last year which is a shame as I love Old Navy and their prices. Anyways since mall jewelry isn't something that I am really familiar with, I just decided to make something that I would wear which leans heavily to the simpler pieces. 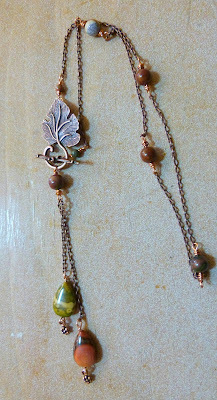 This necklace is made with some gorgeous Ocean Jasper and antiqued brass chain and findings. This necklace also happens to be for sale for $30.00 plus $3.00 shipping and handling. If interested please let me know in your comments. Very pretty! Jasper (pretty much any type) I LOVE!